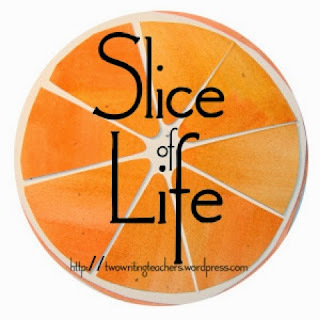 Today is the day I start Slicing. I'm trying this for real. I've read many friends' Slices for the past couple of years, and it's time for me to start. I need to get back into a writing habit. I need to get over my slump. I need to get going on small blog posts so I can keep going on my larger (book) writing project. I need to just write...and hat better way than a challenge to do it for 31 days straight? I need my students to write more. Sometimes in the midst of planning as a language arts teacher for 7th and 8th graders, I start to feel that they're not writing enough. They need more opportunities to just write, to play, to try things out, to challenge themselves, to write without pressure of a longer time period for the writing process...they need to Slice. If I am challenging my students to do something, I always say I better be willing to do it myself also, so here I am...participating for the very first time in the Slice of Life Story Challenge and the very first time guiding and modeling for my students to participate in the Classroom Slice of Life Story Challenge. We are in this together. I'm filled with anticipation and wonderment for where we will all be with our thinking and our writing a month from from now. You will be SO glad you did! I truly believe it changed me as a writer when I participated for the first time last year. It boosted my confidence, and I became a part of a writing community that has encouraged and strengthened me. My class is participating for the first time this year. I'm so excited for that, too. Welcome to SOLSC 2015!! Welcome to our writing community. I'm so glad you're challenging yourself and your students! Wonderful that you took up the challenge to write with us this year! May you find a community that supports and encourages you on your journey as a writer! I can't wait to see where this takes you and your students! How fun to hear their voices emerge, even as you find your own. Best wishes! I could have written this! It's as though you read my mind. School will be out in ten weeks. Well, seniors are done in ten weeks. Then back to the book project. Now on w/ the blogging! YAY! Glad you will be participating this year. I'm like you...I am challenging my students to write daily as well and feel that I need to model that for them. I'm excited to see where this journey takes us. Happy slicing! It's the first step on a journey that you will love - welcome! And bravo to your students, too. Welcome to our challenge and I'm amazed that you are trying both challenges at the same time! I did both challenges last year and it was fantastic, I think you're going to love it! Welcome to SOL15!!! I'm so glad to see so many of my real life friends participating this year. It's amazing how doing these slices for 31 days changes the way you see the world around you. So glad you are on this writing journey -- know that you are not alone! As you reflect on this process of writing for thirty-one days ... you will be amazed at all the benefits -- for you and your students! We can do this!